Combine with Happy Salmon for a huge fin-flapping and chicken dancing game! If you love Happy Salmon, you'll love this! 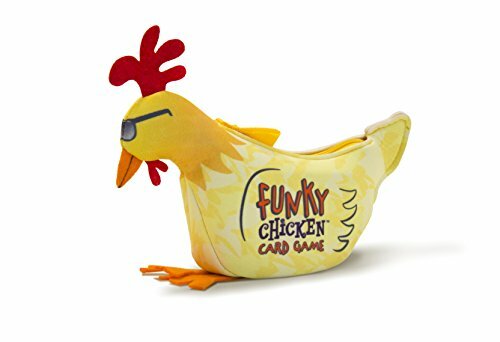 Take all the excitement of Happy Salmon (Golden Geek Best Party Game Nominee, TOTY Game of the Year Finalist), add funky dance moves, pack it in a disco chicken sporting a cool pair of shades and youve got... ... ... Funky Chicken! 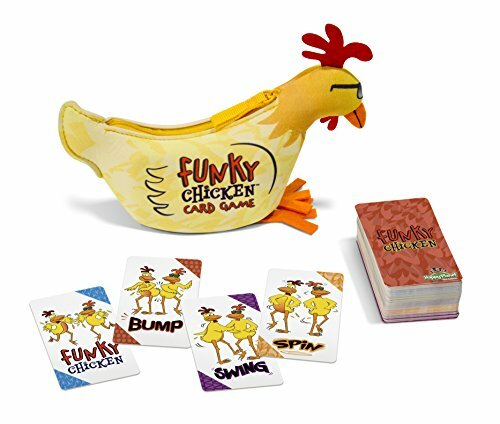 Funky Chicken is a simple, fast-paced card game that gets everyone moving and laughing in under two minutes. There are no turns. Players simultaneously call out the dance actions Bump, Swing, Spin, and Funky Chicken. When two players match, they perform the dance move together and discard their card. The first player to discard all their cards wins. You can play Funky Chicken as a stand-alone game or combine it with Happy Salmon as a crazy alternative to beefy strategy games. The chicken is free-range and the fish is wild Alaskan sockeye - two of the healthiest ingredients any gamer can have in their library. You've already gotten happy. Now it's time to get funky.